Public sector workers such as police, teachers, nurses and firemen cannot afford to buy property in two-thirds of UK towns, as reported yesterday by the BBC following a survey by the Halifax. 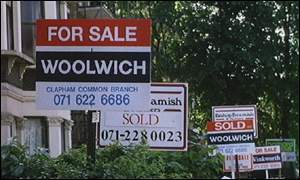 Property is most unaffordable for those in London and south-east England. This news set me thinking about the outstanding problem of London Weighting payments for local government workers and others in London. In recognition of these and other problems, the local government unions put forward proposals as long ago as 2001 to increase the inadequate “London Weighting” payments which seek to compensate local government workers in London for these increased costs by raising the payment to £4,000 across the board (still a lot less than – for example – some police officers receive). The GLA proposals would have meant a significant increase for local government workers in London – but in the absence of any Government funding the employers resisted our claim. Local Councils were prepared to sit out several days of disruptive strike action – and weeks of selective action by key groups of workers. When the unions tried to push the claim to arbitration by a neutral third party the employers withdrew from negotiations rather than allow an independent person to make a judgement of the claim – and it has taken many months to get the negotiating machinery back into operation. We need a serious debate about how London’s trade unions address the issue of the Regionally high cost of living, without compromising our support for national pay bargaining. UNISON has clear national policy in support of regional cost of living payments – but the employers will not lightly be persuaded of the sensible approach suggested by the GLA. This is in spite of the clear evidence that the absence of proper levels of London Weighting payments contributes to high turnover, problems of staff retention and the excessive reliance on expensive agency workers. We need to be cautious about relying too heavily upon housing costs as the basis for our arguments in relation to London Weighting, since housing costs fall unevenly across the workforce – and fundamentally, the solution to housing problems must be better and more progressive housing policy. (We need more public housing which is truly affordable and secure). A real Labour Government would pursue an economic policy which redressed regional imbalances – but would also fund the provision of public services in high cost areas so that fair regional weighting payments were affordable. In the absence of a real Labour Government, our trade unions need to return to the question of how to mobilise political and industrial pressure to solve this problem. Perhaps UNISON activists in London should be thinking about how to address this issue at our Regional Council meeting in the autumn. Jack Dromey, T&G deputy general secretary, earlier this month called for a serious debate about irregular working, in rejecting the arguments of right wing think-tank Migrationwatch, who campaign against mass migration. Mr. Dromey called for irregular workers to become regularised, by way of an amnesty. "Our country and economy needs migrant workers. Irregular working is part of our economy and we need a serious debate about how to tackle it. " "Rather than criminalising irregular migrants, many of whom have lived and raised their families in the UK for years, we should establish a way for them to work and contribute legally. If countries like the United States, Spain and Italy can have an amnesty, politicians wanting a sensible discussion should be prepared to consider its benefits. d) it is not the workers who should be blamed, prosecuted and deported for working here without papers, it is the employers and gangmasters who make it possible. Only with an amnesty for the workers and a few company directors prosecuted will we see any improvement in this shameful situation. Several unions are doing good work to organise migrant workers – but without an amnesty many trade union members are vulnerable to being “shopped” to immigration – which means we are hamstrung in mobilising the collective strength of our members to contest the exploitation which they face from rogue employers. The unions now have an opportunity to push this policy position forward at this year’s TUC Congress by putting the demand for an amnesty as an amendment to a very worthy motion on Migrant Workers which has been placed on the preliminary agenda by the Educational Institute of Scotland (EIS). Will we take this opportunity or will we let migrant workers – including our migrant members – down? According to the Union website (www.unison.org.uk) UNISON will continue to campaign for a ceasefire in the Middle East, despite the ‘disappointment’ of the international meeting in Rome, general secretary Dave Prentis declared today.The union was one of a number of high profile signatories to an open letter to the prime minister on Tuesday, urging him to use the UK’s influence to resolve the crisis. War on Want, Oxfam, Save the Children and Christian Aid were also among those “deeply alarmed” at the humanitarian suffering in Lebanon, Gaza and Israel, and at the UK government’s failure to back a UN call for an immediate ceasefire. Their open letter argued that the government’s policy, based on the assumption that such calls would be ignored, “risks putting civilian lives at continued risk, rather than helping to protect them”.But the UK joined the US in resisting the wishes of 13 other countries and UN secretary-general Kofi Annan to push for a ceasefire. Labour leadership challenger and UNISON member John McDonnell has commented that the world will not forget or forgive the role played by George Bush and Tony Blair at this time. When there was a desperate need for the rest of the world to stand together to secure an immediate peace to save lives they not only failed but connived to allow Israel to prosecute a savage invasion of Lebanon.We must all now do all we can to press our Government to act and call for an immediate ceasefire. If Tony Blair will not make this call the British people will have to do it together themselves, using every form of media available to us, particularly by using the internet to get our message across (see www.john4leader.org.uk). Health unions have warned the government of a "complete collapse of morale" in the health service, should the breakneck speed of NHS reform remained unchecked. A delegation led by the TUC met health secretary Patricia Hewitt yesterday to express concerns about the "creeping privatisation" of the service, the pace of change and the lack of consultation. The crisis talks came as UNISON threatened strike action over the government's plans to privatise the award-winning NHS Logistics. The health unions have also committed to a major joint campaign to press home the problems faced by their members. Local actions in September, alongside fringe meetings at the TUC and Labour Party Conferences, will lead up to a major lobby of Parliament in October, regional demonstrations in November and a national demonstration in the New Year. Details of the official campaign are at www.unison.org.uk - other national campaign information is also available at http://www.keepournhspublic.com/index.php and at http://www.healthemergency.org.uk/. Emergency Clinic a London-wide resource faces closure by October. Stop privatising our health service! UNISON has called for an immediate halt to the opening of any more Independent Sector Treatment Centres (ISTCs), in the wake of a highly critical health committee report. The Commons health committee has warned that the government’s continuing commitment to ISTCs could lead to cuts in services at hospitals. It was time for the government to admit that ISTCs were “a failed experiment resulting from its cavalier attitude to policy development,” said UNISON head of health Karen Jennings. Jennings was planning to raise the issue with health secretary Patricia Hewitt today, in a meeting with other health unions and stakeholders. To date, 21 ISTCs have been set up at a cost of £5bn, to carry out minor surgery that includes hip operations, ear, nose and throat treatment and cataract operations. Investing the money spent on ISTCs into the NHS may have been a cheaper and more efficient option, the committee reported. Jennings welcomed the report as a “welcome, honest, critical look” at government policy on ISTCs.“It underlines the case that it would be simply throwing good money after bad to allow any more private treatment centres to open,” she said.“The health committee is damning in its conclusions that, if the planned phase 2 goes ahead, we will see not only whole wards closing, but whole hospitals. “UNISON has always maintained that opening these centres was a leap in the dark.”The committee agreed that there had been no systematic attempt to measure the impact of ISTCs on the NHS, Jennings added.“It is a criminal waste of taxpayers' money that most of these centres are working at less than 50% capacity, but still get paid the full contract price”. NHS strike ballot, demonstrations - the fight for our NHS hots up! UNISON, the UK's largest health union, is to ballot staff at NHS Logistics for strike action over government plans to privatise the award-winning service.Staff at the five depots are angry at the proposed transfer of the entire organisation to private haulage company DHL.NHS Logistics is a not-for-profit organisation supplying hospitals, GP surgeries and patients with more than 43,000 items including essential surgical supplies and products ranging from aerosols and arrowroot to zinc and castor oil. As a group of MPs released a scathing report on the system of NHS charges in the UK, pressure group Health Emergency warned that the scale of charging is set to escalate under New Labour's market-driven NHS reforms. Health Emergency claimed that the Foundation Trusts, run as quasi-commercial businesses, are almost under obligation to squeeze every penny that they can out of patients and relatives when they are on the hospital site. The increasing involvement of private companies in the NHS means that they will bring their "maximum profit" practices into our hospitals and health centres. At the weekend, 10,000 people took to the streets of Cheltenham in support of our NHS in a march and rally organised by the local UNISON branch. UNISON will take the campaign to the TUC and to the heart of the Labour Party. With the other health unions, UNISON will be mobilising for a mass lobby of Parliament in the autumn and for a national demonstration in the New Year. For more information visit www.healthemergency.org.uk and www.unison.org.uk. UNISON member, John McDonnell MP received the overwhelming endorsement of the annual meeting of the Labour Representation Committee (LRC) to stand for Leader of the Labour Party when Tony Blair stands down. The third annual meeting of the LRC was the best attended and most positive meeting the LRC has held, and Labour Party and trade union members at the meeting were united in enthusiasm for John's campaign. Socialists and trade unionists in the Labour Party now have a focus for campaigning activity over the coming year as we assert our right to challenge for the future of our Party, which was created to represent working people - not as a vehicle for New Labour careerists and hangers on! In UNISON (and the other Unions) we will need to discuss whether we should be timid and hope that we can influence Gordon Brown - or whether we give our full backing to a candidate standing on a programme of policies which our unions would support. For more information check out http://www.john4leader.org.uk/. This Saturday - support the reds! The Annual meeting of the Labour Representation Committee (LRC) takes place this Saturday – 22 July – from 10am at Congress House. Full details are available online at www.l-r-c.org.uk. The theme of this year’s meeting is “Challenging for Labour’s Future” – and it is about time that those of us still waiting for a Labour (rather than New Labour) Government which supports the policies supported by our trade unions got together and got organised. You can turn up and pay your registration and membership on the day. UNISON members will be caucusing over lunch to discuss how to pursue the debate about the future of the Party within our Union. UNISON branches in local government have until this coming Monday to respond to Head Office over Government consultation on these draft regulations which amend the way in which redundancy payments are calculated. Given how often we face redundancy situations in local government, this is an important topic – not least because employers may use this as an opportunity to make changes to their policies which are not strictly required by law – although all employers will have to review their policies on redundancy payments before the Age Discrimination Regulations come in on 1 October. The Government has said that in order to comply with the Age Regulations, it intends to replace the current compensatory formula that provides up a maximum payment of 66 weeks’ pay based upon age and length of service, with a discretionary power to award compensation to eligible employees up to a maximum of 2 years’ pay (104 weeks). Similarly, the Government is removing the power within the Discretionary Compensation Regulations to award compensatory added years to eligible employees over the age of 50, although authorities will still be able to award added years in certain circumstances by using the augmentation provisions under the Local Government Pension Scheme. The maximum number of “added years” will now be 6 2/3rds – and augmentation has to be funded by a one-off up front payment by the employer into the pension fund, rather than paying over a longer period as has been possible. The consultation document sent out to UNISON branches in June is at http://www.unison.org.uk/acrobat/B2498.pdf. The consultation letter from the Government is at http://www.xoq83.dial.pipex.com/060508.htm. The draft regulations are at http://www.xoq83.dial.pipex.com/060508regs.htm. Apologies to any readers who aren’t interested in local government redundancy payments, but this is a significant topic for a lot of UNISON members! Radical advice from the TUC? According to their website the TUC is today (Tuesday) launching its 'cool work' campaign as it urges employers in the UK to follow the lead of Japanese businesses and relax dress codes as the temperature rises. According to today's news on the website and in line with our policy, UNISON believes there should be an immediate ceasefire on all sides in the Middle East and that both the Israeli and Palestinian hostages, including elected parliamentarians and government ministers, should be unconditionally released.The rapid escalation of events in the Middle East is causing huge suffering to civilians - men, women and children - and to the cause of peace. Whilst Israel has the right to exist within secure borders and to defend itself against attack, its totally disproportionate use of force against the Palestinian people could lead to the collapse of the Lebanese government with the threat of renewed civil war.Our government should take a more robust stance, insist on a return to the Road-Map by all parties and support the suspension of the EU-Israel Association Agreement and the sale of arms if Israel fails to comply. Check www.unison.org.uk. "Britain could play an important role in preventing the further escalation of this conflict and in laying out the terrain for its resolution.Israel is only influenced in any meaningful way by the US. Britain must now call upon the US administration to make it patently clear that it does not support the present Israeli military action and that consequences for the Israeli/US relationship would follow if Israel persists in its attacks on Lebanon and Palestine.Britain, along with its European peace allies, should now seek a mediating role via the UN. First, to negotiate a ceasefire and subsequently the handing over of prisoners from both sides.There is a possibility that we could assist all parties to this conflict to step back from the brink. But we can only succeed in playing this role if Britain is demonstrably seen to be independent of the Bush administration. " See www.john4leader.org.uk. 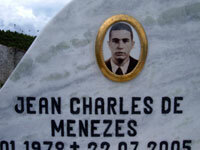 The local UNISON branch of which I am a member, in Lambeth, South London, was one of many local community organisations appalled at the killing of Jean Charles de Menezes on 22 July last year. The news that no one will face prosecution over this killing has been very badly received in our local union office – and will be badly received by our members locally. The situation in the Middle East is escalating into a very dangerous international crisis. Trade unionists in the UK cannot stand back and ignore this crisis. UNISON backs the Stop the War Coalition, of which our Deputy General Secretary, Keith Sonnet is Vice Chair. UNISON has clear policy on Palestine and the Middle East peace process as set out in several National Delegate Conference (NDC) motions over the past few years. UNISON supports both an independent Palestinian state and the right of a secure Israel to exist. However, UNISON believes that this can only happen if Israel withdraws from the Occupied Territories to its 1967 borders. 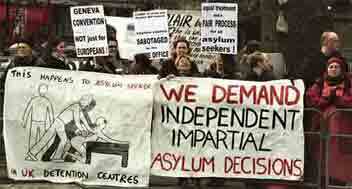 Amnesty for Migrant Workers - will the means as well as the end! Today’s Independent comes out – in its Leader column – in favour of an amnesty for “illegal” migrants, pointing out that this is the policy of the Transport and General Workers Union (TGWU). It is also, of course, the policy of UNISON (see http://www.unison.org.uk/conference2006/news_view.asp?did=2710). However, the Independent also covered some serious misrepresentation from New Labour “spin doctors” about the Labour leadership campaign of John McDonnell MP, which is dealt with very well on John’s blog (http://www.john4leader.org.uk/ ). It’s no good “liberal” papers – or national trade unions for that matter - supporting sensible and progressive policies such as an amnesty for “illegal” migrants, if they won’t also back a progressive, socialist candidate for leader of the Labour Party! It is no good willing the end of progressive politics if you won't will the means to get to that end. How can we fight NHS privatisation? The government has republished an advert inviting private companies to run primary health services, despite a row which forced the original advert in an official EU journal to be pulled two weeks ago. To fight cuts and privatisation in our health service we need our unions to be backing initiatives like tomorrow’s demonstration in Birmingham (http://www.nhssos.org.uk/) and working with the effective campaigning organisation that brings together unions and patients - Keep Our NHS Public (http://www.keepournhspublic.com/index.php). We also need to use our relationship with the Labour Party to fight for union policies in the Labour Party. This cannot be done by pretending that we can have “influence” with the New Labour dross currently running the Party – who will remain in charge under Gordon (PFI) Brown. UNISON should be piling on the pressure for the real Labour Government whose policies would reflect the views of ordinary people, which means fighting to change the leadership of the Labour Party. Good News at the UNISON NEC! It was reported to the National Executive Council (NEC) on 12 July that UNISON had won an impressive number of awards for press and publicity work from the Trades Union Congress (TUC) and also that Croyde Bay, UNISON’s Holiday Centre had been awarded four stars. I went to Croyde Bay for the first time earlier this year and can thoroughly recommend it. Another small item of good news from the start of the meeting was that the NEC rejected an attempt to exclude Glenn Kelly, a local government NEC member from the Greater London Region, from discussion about National Delegate Conference. Glenn had attended Conference as a delegate from his branch rather than as an NEC member and a small minority of NEC members felt he should not be part of any discussion on the NEC about Conference. A slightly larger minority (of which I was one) thought Glenn should stay, and the majority abstained – so Glenn stayed and joined in the discussion. I expressed my concern that Conference had got through so few motions, and that the President had unnecessarily closed Conference early on the final afternoon. I should point out that the picture above relates to Croyde Bay and not to Glenn Kelly. It was reported to the UNISON National Executive Council (NEC) on 12 July that the UNISON Health Service Group Executive (SGE) had voted to recommend an offer to members in a ballot. The detail will be covered in material accompanying the ballot papers and in information to health branches. There are a number of improvements to the pension scheme which are to be implemented, and some positive features of the scheme for new starters (although they will have a normal retirement age of 65, compared with 60 – or in some few cases 55 – for current members). The proposal also includes graduated contributions, with a significantly larger group of lower paid members benefiting from a contribution rate of 5% than at present, whereas the large majority of the workforce will see an increase from 6% to 6.5%. The highest paid will pay 7.5%. Several NEC members asked about how graduated contributions would work in practice and were promised a written response. I expressed my concern that an increase in contributions in order to secure the protection which had been promised last October seemed to breach the spirit of the Framework Agreement. Dave Prentis pointed out that the Agreement had said that there would be no changes without agreement and that, if we agreed to these changes, they would not breach the Agreement. Members affected will now have an opportunity to vote on the proposals in a ballot, which I understand is likely to take place in the autumn. The UNISON National Executive Council (NEC) on 12 July received a report on current developments in relation to both the Local Government Pension Scheme (LGPS) and the National Health Service Pension Scheme. In relation to the LGPS dispute, we were told that it could be two to three months until UNISON’s application for judicial review is heard in the courts. A further round of negotiations is to take place with the employers and the Government, to address both the “new” (post 2008) scheme and improved protection for existing members of the current scheme. The Joint Union Strike Team (JUST) have now agreed that there would be a further strike ballot before any more strike action. There will also be a membership ballot on any “final offer” which, it now appears, will deal with both the outstanding issue of protection and the details of the new scheme. The report emphasised that plans should still be being made for further industrial action and that we must not lose momentum. Developments since we – wrongly in my view – suspended industrial action before the May local elections have only reinforced my concerns about that tactical blunder. If any branches involved in the dispute would like a more detailed report, or for me to attend a Branch Committee meeting to report back, please get in touch. The latest information is being circulated regularly from Regional office and can be found at http://www.unison.org.uk/pensions/index.asp. The NEC received a draft of some legal advice which will shortly be issued to all branches in relation to negotiations on pay and grading in the light of the recent employment tribunal decision in the case of Allen –v- GMB. It will be very important that the legal advice is circulated in full and without any additional comment made by or on behalf of the Union, because UNISON is involved in litigation, and the Union’s position could be jeopardised if internal Union documents are used against us. It is fairly clear that the advice will urge caution on branches – and it is certainly the case that anyone involved in negotiations on pay and grading should be making sure that their Regional official is fully involved in order to ensure that branches benefit from the best advice. I have read, and have an electronic copy of, the tribunal judgement if anyone would like to see it, and would be happy to attend any Branch Committees to discuss this topic further. At the UNISON National Executive Council (NEC) meeting on 12 July, Dave Prentis, General Secretary, elaborated on the report he had given earlier to the TUC delegation meeting. He emphasised the concern of all the trade unions (including those not affiliated to the TUC) at the change of direction of Government policy in relation to health in recent months. He expects that the vacancies for Chief Executive and Head of Human Resources for the NHS as a whole will both be filled from the private sector. The Royal Colleges of Nursing and of Midwives, as well as the British Medical Association, were united with the TUC affiliated health unions, led by UNISON, and would be briefing all MPs before the summer recess. After major fringe meetings at both the TUC and Labour Party Conferences (at both of which it is likely that UNISON will put this issue on the agenda) there will be a mass lobby of Parliament in the autumn and, provisionally, a national demonstration in the new year. Dave described UNISON’s objective as to “slow down the pace of change”. NEC members from the West Midlands region reported on very successful campaigning activity across service groups in their region, and I asked that this information be passed on to all regions. Some concerns were expressed about the timetable for the campaign, I was concerned that we should not be too timid. However, some colleagues from the health group pointed out that the situation on the ground was uneven, as cuts were biting deep in some areas but not others, and that we needed time to get a national campaign off the ground. I hope all branches will get involved with this campaign – we must not leave our health service brothers and sisters to fight alone to defend the NHS, upon which we all depend. I imagine that further details will be posted at the relevant point on the UNISON website - http://www.unison.org.uk/healthcare/keepNHSworking/. Today’s meeting of UNISON’s delegation to the Trades Union Congress agreed two motions to be submitted by UNISON to the TUC. The first motion, on the campaign to defend the National Health Service, calls upon the TUC to lead a major campaign against job losses and privatisation. Dave Prentis, General Secretary, reported from yesterday’s meeting of health unions. All health unions are complaining to the Secretary of State about the current trend of Government policy – Dave reported his view that some Government Ministers do not know what is going on in the health service. UNISON will be convening fringe meetings at the TUC and Labour Party Conferences on behalf of all health unions, and plans are in hand for a mass lobby of Parliament in the autumn and probably a major national demonstration in the New Year. I tried, without success, to persuade the delegation to include a specific reference to the Keep Our NHS Public campaign, in line with UNISON Conference policy. This afternoon the National Executive Council will be meeting and we expect to receive further information about the campaign to defend our public services – and our NHS in particular. Stop job cuts in our health service! Vital services provided by the South London and Maudsley NHS Trust (SLaM) are at risk – and the local UNISON branch, working with London Health Emergency, has kicked off a campaign to resist these cuts. The cuts in SLaM could lead to the closure of the London wide 24 hour psychiatric service a the Maudsley – removing a vital service from the whole city. With job cuts and deficits across the country, I hope that UNISON’s National Executive, meeting tomorrow (12 July) will be discussing how we build a national campaign against job losses in health. Meanwhile, staff at the North West London Hospitals Trust - which includes Central Middlesex and Northwick Park - have taken to the streets in protest at 422 job losses as part of a £23 million cuts package which could see the closure of the casualty department at Central Middlesex Hospital, the nearest A&E to the new Wembley Stadium. To keep up to date and find out how you can get involved visit http://www.healthemergency.org.uk/. All UNISON members need to support the campaign against job losses in our health service. ID card scheme in crisis? It is good to see that the Government’s plans to introduce ID cards are in such disarray (http://www.guardian.co.uk/idcards/story/0,,1816799,00.html). UNISON is opposed to the government’s ID scheme and remains concerned about the cost of the scheme and the impact on race relations and civil rights.The scheme is expected to cost up to £19bn, and charges are likely to impact most on the poor, especially those living in insecure accommodation who are expected to be charged for changes to the database every time they change address. This policy was reaffirmed at this year’s National Delegate Conference (see the report at http://www.unison.org.uk/news/news_view.asp?did=2701). Conference delegates expressed alarm at the potential impact on race relations. There was concern that black and ethnic minority people would be targeted when trying to access public services, and would be subject to more frequent stop and search procedures. To find out what you can do to support UNISON policy and oppose ID cards visit http://www.no2id.net/. Unfortunately very few Members of Parliament opposed the Government on this issue – including only a handful of those MPs linked to our Union, so writing to MPs to push them to oppose the ID card scheme now that it is falling apart seems like a good idea. As I have been preparing this blog for real publication I realise that it is good to link to other (good) websites. The best speech I heard this year at UNISON Conference was at the Greater London Regional Fringe meeting in support of the Stop the War Coalition. 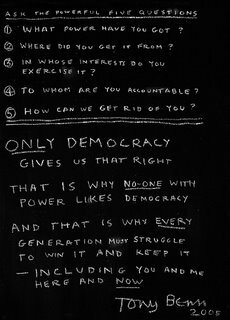 It was given by Tony Benn - so visit www.tonybenn.net as often as you can! UNISON in Greater London should be organising transport for the next big anti-war demonstration in Manchester on 23 September (on the eve of Labour Party Conference) - details will be at www.stopwar.org.uk. I agree with John Denham that the government must overhaul the immigration system to crack down on illegal working, which exploits the poor and allows British firms to be undercut by cheap labour ('Call to halt exploitation of illegal workers', News, last week). This is why my union, Unison, called on the government last year to grant an amnesty to anyone working in the UK without the knowledge of the authorities, in order to put an end to employer-led tax fraud and exploitation of migrant workers. Only an amnesty can end this exploitation. Before the letter was edited, I also emphasised the importance of union organisation of migrant workers. Some excellent work is being done in the Greater London Region of UNISON to develop organising of migrant workers – the Regional website is at http://www.unison.org.uk/london/index.asp. More on UNISON national policy is available at http://www.unison.org.uk/international/migration.asp. If you are an activist in a Greater London Region UNISON branch you should speak to your Regional Officer for support in recruiting and organising migrant workers. 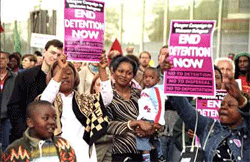 For news about or help with anti-deportation campaigns visit http://www.ncadc.org.uk/. UNISON Conference agreed this year to note “with dismay the growing negative effects that the marketisation of the National Health Service (NHS) in England is having on staff and patient services. According to a recent survey by the Health Service Journal, 63% of hospital trusts have been forced to close wards as a result of financial shortages, a quarter have made staff redundant and 75% have been forced to freeze recruitment.” (See http://cms.unison.co.uk/MotionText.asp?DocumentID=996419). The threat to the future of our National Health Service threatens all of us, not just those UNISON members – and members of other unions – working in the NHS. Check out the Keep Our NHS Public site for the latest information (http://www.keepournhspublic.com/index.php). 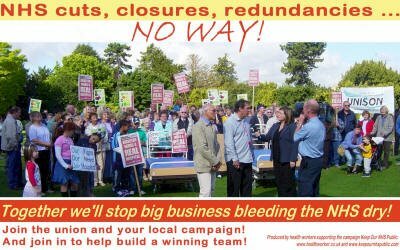 And for details of UNISON’s own campaigning activity go to http://www.unison.org.uk/healthcare/keepNHSworking/. And for an interesting unofficial website aimed at workers in the health service, see http://www.healthworker.co.uk/. If any UNISON members in Greater London are campaigning against cuts in the NHS please keep me – and your other NEC members – posted. Fighting health cuts is a major priority for everyone in UNISON. Is UNISON an anti-nuclear Union? It is good to see that the Government’s review of energy policy will commit it to increase renewables – but scary that the Government are clearly keen to build new nuclear power stations (http://observer.guardian.co.uk/business/story/0,,1815874,00.html). Tony Blair presumably wants a (radioactive) legacy which will last for centuries! will be lost.” Details of the policies adopted at last year’s UNISON Labour Link forum are at http://www.unison.org.uk/acrobat/B1941.pdf. UNISON Conference has never taken a clear policy position on nuclear power – the issue comes to a head each year when our delegation to the TUC Congress (the annual meeting of all trade unions in the UK) when we have to decide how to vote on a composite motion about energy policy which normally says something nice about nuclear power (because several other large unions have significant membership in the nuclear industry). It is the received wisdom in UNISON that we have a policy against new nuclear power stations but are not necessarily for the immediate closure of existing nuclear plants. Since being on the on the NEC, and therefore attending the TUC as part of UNISON’s delegation I have asked from time to time about where our policy was agreed. 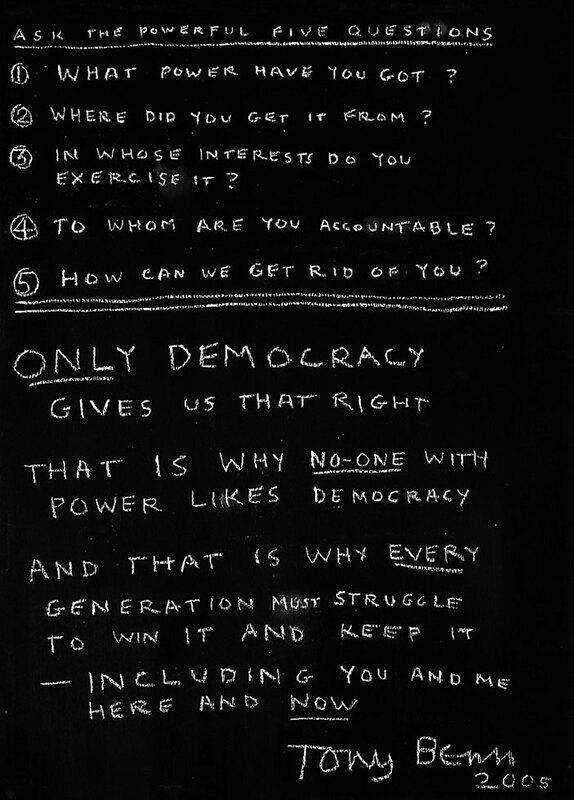 At this year’s national delegate Conference I was given the answer. Now that the nuclear lobby have seduced the Prime Minister I hope that UNISON will be lining up more clearly with the anti-nuclear lobby. I shall report back on discussions in the run up to this year’s TUC! Where can I vote and make a difference? No, this isn't a mass meeting welcoming this blog by popular acclaim. 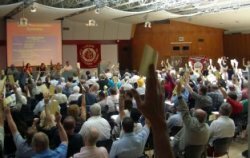 This is a vote at last year's annual meeting of the Labour Representation Committee, the rank and file organisation for ordinary Labour Party and trade union members. There is a bit of a row going on about Equal Pay at the moment, and it surfaced on Women's Hour on Radio 4 on Thursday (http://www.bbc.co.uk/radio4/womanshour/01/2006_27_thu.shtml) - this relates to the difficulties which those of us trying to implement Single Status in Local Government are experiencing - but the problems are common across all the services in which UNISON organises. For the official UNISON view see http://www.unison.org.uk/equalpay/ and for an interesting and entirely unofficial website see http://www.labouruniondigest.org.uk/index.php?page_id=13. I have no time whatsoever for the solicitors who are taking cases against the unions as well as against employers (all on a lucrative "no win no fee" basis). It is a nonsense that because of litigation being taken against trade unions, UNISON did not debate Equal Pay at our Conference. I hope to report something more substantial from the next meeting of our National Executive Council (NEC) which takes place on Wednesday. I am awake at night worrying about my pension! I’m a member of the Local Government Pension Scheme (LGPS) – other UNISON members are in other schemes and they are all under attack. The Government consultation document on the future of the LGPS is at http://www.communities.gov.uk/pub/208/WherenextOptionsforanewlookLocalGovernmentPensionSchemeinEnglandandWales_id1501208.pdf - it is pretty clear that, apart from anything else, LGPS members could be facing an increase in employee pension contributions, just as has been proposed in the National Health Service. The consultation document assumes that the only change which will have been made to the amendments to the LGPS made earlier this year (abolishing the Rule of 85) will those which have recently been consulted upon. That means that the Government have decided not to extend protection to the under 50s – unless they go along with the Scottish Executive who have generously extended that full protection to those aged 46 and over. If anyone now doubts that it was a mistake to accept a deal excluding the LGPS in October 2005 and to suspend our strike action in April 2006 then I can only think that they have not been paying attention. If the newspapers make you think that there should soon be an election for Deputy Leader of the Labour Party, well then apply that to the Leader as well. "I was with thousands of other UNISON members who heard, and welcomed, the warning given by our General Secretary to Gordon Brown not to rely upon our support (Tribune June 23). However, his suggestion that the left should not challenge the man who subsequently came out quite unnecessarily in support of replacing Trident, whilst continuing to support the privatisation of our public services was very disappointing. Keith Sonnet, our Deputy General Secretary and Labour NEC representative, addressed the best fringe meeting of the Conference alongside Tony Benn, for the Stop the War Coalition. He agreed that our Union should do nothing to support a leadership candidate who had backed the Iraq war. I agree with Keith, but would go further. If our Union’s link with the Labour Party is to survive it must mean that our members are offered an opportunity to vote, in a leadership election, for a candidate who can be relied upon to support our Union’s policies. This is not about a “token” challenge from “the left” it is about offering trade unionists a clear example of why we should continue to be part of our Party. Unless enough MPs can be persuaded to nominate a candidate who supports public services, manufacturing, union rights and equality – and who has opposed the Iraq war – our members will be denied the opportunity to support a candidate who supports our Union policies. Trade union general secretaries should be calling upon MPs to nominate a candidate who will support trade union policies – otherwise warning Brown that he “cannot rely upon our support” is empty rhetoric." Some confusion about the Labour Party? Tony Blair's recent article was published under the heading "No more coded critiques - let's have an open debate on where we go next" (June 27). We welcome that and agree there should now be an open public debate on the future direction of our party and government. In particular, we believe there is now an urgent need to focus on the following issues: ending poverty and rising inequality; a government and party leadership which is accountable; an end to privatisation of public services; foreign policy; and employment rights and trade union law. Due to a misunderstanding the names of Angela Eagle, the MP for Wallasey, Dave Prentis of Unison, Derek Simpson of Amicus and Paul Kenny of GMB were incorrectly included among the co-signatories to a letter headed An open debate on Labour's future, page 35, yesterday. What are we to make of this? Is it fair to blame the Grauniad? Might responsibility lie in the office of one of the MPs who signed the letter?? With thanks to the anorak who pointed this out to me! This is a personal report of the NEC meeting which took place on Wednesday 7 June 2006, which I circulated to those branches for whom I had an Email address in the hope that it might have been useful in the run up to National Delegate Conference. These are the sort of reports which I will post here from now on. Although I won't go on at such great length in future (I promise). The meeting commenced with some controversy arising from sensible proposals from the Executive Office to try to reduce the expenditure on NEC meetings (which has been overspent) by using cheaper hotels – if any branches would like further details about this please let me know. The meeting then moved on to the agenda. The meeting noted that, as Glenn Kelly, representing local government on the NEC, was attending Conference as a branch delegate he would be asked to leave those parts of any NEC meeting dealing with Conference business. The NEC agreed policy on some motions to Conference which had not previously been dealt with. It was agreed to oppose a motion calling for the closure of current nuclear power stations as this was in line with our current policy to oppose new nuclear stations but not existing ones. I asked for evidence of this current policy, but did not oppose the proposal. The place to change such a policy would be at National Delegate Conference – branches may want to discuss nuclear power when mandating delegates to Conference. Various composite motions have been agreed by the Standing Orders Committee and these were put to the National Delegate Conference to agree policy. The NEC is supporting all the composites except Composite E on the Education White Paper, which is being opposed on the grounds that it calls for a national demonstration. I unsuccessfully proposed that the NEC should support Composite E.
The NEC also agreed policy on amendments to motions at National Delegate Conference.The NEC is supporting all amendments except 2.2, 3.3, 3.4, 17.2, 35.6, 35.9, 65.1, 78.1, 79.1, 81.1, 82.1, 101.2, 107.1, 108.1,126.2, 145.1 and 146.1. If branches would like to know about any particular amendments, please get in touch. Motion 17 calls for a National Conference on Health and Safety. It has attracted two amendments, one from the NEC (17.1) proposing Regional seminars as an alternative and one from the South East Region (17.2) proposing a national seminar as an alternative. Following discussion at the Regional Health and Safety Committee I queried the NEC policy of opposition to amendment 17.2 from the South East Region. Roger Bannister who sits on the National Health and Safety Committee from the NEC explained that the National Health and Safety Committee had drafted amendment 17.1 and urged the NEC to support that against amendment 17.2, which was agreed. Our Region is, of course, already organising a Regional seminar in the autumn. Branches may wish to look at amendment 17.2 as a way of building upon the good work already being done at Regional level. The NEC also agreed a provisional list of NEC speakers for Conference and two Emergency Motions, one on opposition to the British National Party and one on Government attacks upon the Access to Work scheme. Branches who may wish to be involved in Emergency composites on either topic (should the motions be admitted to the agenda by the Standing Orders Committee) have until Monday to get motions submitted on the appropriate form, having agreed them at a quorate meeting (please get in touch if you need any more information about how to submit Emergency motions to Conference). The NEC received an update on very strong recruitment this year, associated with the dispute over the Local Government Pension Scheme (LGPS). Greater London Region was specifically mentioned for overcoming the highest turnover in the country to record growth in the first few months of this year. It was reported that an organising campaign is to be launched at National Delegate Conference. The NEC received a brief – one and a half sides of A4 – report which provoked a long debate about the LGPS dispute. It was reported that the trade unions had “noted” the proposals on which the Government have gone out to consultation and did not support or endorse them. It was reported that the other trade unions were not in favour of resuming industrial action at this time. They preferred to await the outcome of the judicial review for which UNISON has applied, and which is proceeding. It is hoped that there will be an early hearing of the judicial review and that this will force the Government to withdraw their current proposals. Louise Couling asked a question to confirm that the other unions had made clear their opposition to resuming industrial action. It was confirmed that this was the case. I asked a series of questions about our campaigning activity, in particular why this seemed to have tailed off and why we had not lobbied in support of an Early Day Motion (EDM 1973) calling for the Regulations to be revoked. I expressed disappointment that we had allowed ourselves to lose momentum in the dispute since the suspension of the action. It was subsequently agreed that the campaign did now need to be “stepped up” – the Head of Local Government advised the meeting that UNISON had supported the Early Day Motion in question, but the Chair of Labour Link, Steve Warwick, reported that UNISON MPs had not felt that an Early Day Motion was the right tactic at the time. Glenn Kelly said that he hoped that the Local Government Service Group Executive would support a resumption of industrial action, and that there ought to be no need to re-ballot in this case. Graeme Horn (West Midlands) asked specifically if a re-ballot was necessary. The Deputy General Secretary confirmed that there would be no legal requirement to re-ballot but that there might be practical reasons why this would be recommended. Moz Greenshields (East Midlands) felt that further industrial action was “inevitable” as the dispute was not resolved and asked about our lobbying of the European Commission. In response the Head of Local Government reported that UNISON had been speaking with the European Commission but that there was no prospect of their taking any action until there was a final set of proposals, and after the judicial review which UNISON has instigated. Stephen Mead (Higher Education) urged the NEC to put its faith in the judicial review and commented that the proposals on which the Government are currently consulting were the best that could have been obtained before 1 October. He reported that the Higher Education Service Group Executive was not confident of support for further industrial action at this time. Roger Bannister (North West) commented that we had taken the pressure off by suspending the action and that as a result the Government and employers were taking advantage. He warned against relying on legal action. John McDermott (Yorkshire and Humberside) described the Government’s proposals as totally unacceptable and urged a special conference and a membership ballot on any proposals on protection for existing scheme members. In response the Head of Local Government said that it was current policy of the Local Government Service Group to hold a ballot only on any final proposals for the new-look LGPS itself. As well as explaining the Labour Link view on the Early Day Motion, Steve Warwick (South West) said he hoped for a “sensible” decision from the Local Government Service Group Executive (by which he clearly meant not the resumption of industrial action). Diana Leach (South East) asked about the position in Scotland. It was explained that the Scottish employers had wanted to make a better offer but the Scottish Executive had been warned off by the Treasury. Irene Stacey asked about the position of low paid workers excluded from the pension scheme, and also how many branches had contributed funds towards the dispute. It was explained that very few donations had been received and that the majority of all donations had come in one large donation from the Greater London Region. Chris Tansley (East Midlands) stressed his view that the employers were clear that the current proposals for limited protection were only “interim” pending the judicial review and that negotiations should continue. He favoured a re-ballot to maintain unity. Raph Parkinson (Additional Members seat) reported on strong support for industrial action in Liverpool and urged the NEC to be confident of our members’ willingness to take action. He felt a re-ballot need not be viewed negatively as it could demonstrate our members’ willingness to take further action. Jane Carolan (Scotland) explained the position in Scotland and stressed that our focus was not on the “Rule of 85” per se but on developing a fair and equitable pension scheme. Mike Hayes (Wales – and Chair of the Finance Committee) reported on donations to the fund set up for the dispute. The Head of Local Government concluded the debate, making various points which I have reported above alongside the comments to which they were a response. She also acknowledged that funding problems of some NHS employers had been raised as an issue in discussions about the future of the NHS pension scheme. The NEC received a detailed report on future proposals for the Positively Public Campaign, which had been approved by the Policy Committee. This was a discussion document, and it provoked considerable discussion. If branches would like sight of an electronic version of this document please let me know – but please bear in mind it is a discussion document! One of our Policy Officers introduced the report, which emphasised how UNISON would aim to organise seminars and to invite Government Ministers in order to achieve influence with the Government. Glenn Kelly commenced debate on the report with some sharp criticism of aspects of the report, in particular a proposal that UNISON would arrange “dinners” for Government Ministers. At this point the General Secretary intervened to make clear that that particular proposal had already been rejected. I made some criticisms of the way in which the report failed to create an opportunity for members to participate in our campaign for public services – as would be created by (for example) supporting the lobby of Parliament on 27 June. I also expressed my concern that the report might be seen as diluting our opposition to privatisation, not least because it referred to moving away from reporting “bad news” in our bulletins. Moz Greenshields (East Midlands) asked a series of questions about the report and expressed concern at positive references to the use of the “Toyota Total Quality Management” approach in local government. John McDermott (Yorkshire and Humberside) expressed further criticisms of the report. Chris Tansley (East Midlands) welcomed the report as providing a strategic approach and defended UNISON’s link with the Labour Party. Graeme Horne (West Midlands) supported this view and stated that the Positively Public campaign had established UNISON as “credible” which would be important in maximising our influence with a change of Prime Minister. Louise Couling reported that seven representatives of the Greater London Regional Labour Link Committee had recently participated in an event alongside Government Ministers and had felt optimistic and listened to as a result. Linda Coey (Northern Ireland) reminded the NEC about the current Public Administration Review in Northern Ireland and its relevance to this debate. Steve Warwick (South West) – speaking as Chair of Labour Link – welcomed the report and advised the NEC that the Labour Link was working on a strategy for the Third Term (of a Labour Government) and to maximise influence with a new Prime Minister, which would be reported to the Labour Link forum at the end of June. Jane Carolan (Scotland) – speaking as Chair of Policy – expressed her surprise that any NEC member should think UNISON was diluting its opposition to privatisation and expressed her strong support for the report, which had been agreed by the Policy Committee and supported strongly at a meeting of Regional Secretaries and Convenors. In responding to the debate, the Policy Officer emphasised that the report was a discussion document and should not be seen as diluting our opposition to privatisation. The NEC received a copy of a very brief confidential report which had been considered by the Services to Members Committee of the NEC on 26 May. The essence of this was that the NEC is consulting within the union on the definition of “mass litigation” for the purposes of determining those legal cases to which a 5% fee should be applied if they are successful (strictly speaking these cases are taken by Thompsons and not by UNISON, as our Rules do not cover charging such fees). Glenn Kelly asked about why we still did not have a definition of mass litigation and it was explained that this was the subject of consultation. I asked about the progress of the litigation being taken against the Union. The NEC was also advised that litigation against UNISON has been stayed pending a case against the GMB, the outcome of which is expected to be known by the end of next week (i.e. before Conference). These are cases, backed by No Win No Fee solicitors and taken against trade unions on behalf of union members who claim that agreements reached in relation to grading compromised their rights to Equal Pay. It is hoped that the NEC will be in a position to make some sort of statement at Conference. John McDermott (Yorkshire and Humberside) stressed how absurd it was that UNISON was not discussing Equal Pay at our Conference. The NEC received an update report on the “Keep the NHS Working Campaign” about which you can get further details on the UNISON website. The Union has already supported a lobby of Parliament alongside other unions on 11 May and various campaign activities are in the planning stage, including local, regional and national demonstrations. The focus of the campaign will be on the financial crises in those NHS trusts with deficits, and on defending the NHS against privatisation. Sandra Dean (West Midlands) reported that in the West Midlands campaigning activity was well underway and that the Region wanted to see more central direction. Glenn Kelly expressed doubt about the campaign if, as had seemed from earlier debates, UNISON was going to put its faith in Gordon Brown as Prime Minister. I welcomed the report as very positive and asked for an assurance that we would be working with the Keep Our NHS Public campaign and that we would involve members from all service groups in the defence of the NHS. Norma Stephenson (Northern) pointed out that not all NHS trusts had deficits. Annette Mansell-Green (West Midlands and Chair of the General Political Fund (GPF) Committee) responded to Glenn Kelly’s points by pointing out that campaigning work would be undertaken by the GPF as well as Labour Link. John McDermott (Yorkshire and Humberside) suggested that UNISON estimate and publicise the share of the total NHS budget which was going to pay profits to companies involved in PFI projects. June Nelson (Additional Members seat) stressed the scale of the financial problems confronting our members in London in particular. This point was echoed by Sue Highton (Yorkshire and Humberside) who stressed the urgency of a campaigning response to the financial problems of the NHS. Mike Folliard (Health) pointed out that there was not necessarily an overall shortage of NHS funding – the problem was that funds were not allocated where they were needed. Steve Warwick (South West) speaking again as Chair of Labour Link, responded to Glenn Kelly refuting the suggestion that he – or anyone else – had put any faith in Gordon Brown. Dave Prentis intervened to point out that the Union had traditionally focused on two key campaigns, chosen each year after Conference, and that this could be one of those two campaigns for the coming year. In responding to the debate, the Policy Officer pointed out that this was a preliminary report and acknowledged many of the points which had been made. The NEC received the annual financial reports which are going to Conference. Following discussion at the Regional Health and Safety Committee I asked for a detailed breakdown of the part of the budget which covers health and safety and was promise a written response (which I will pass on to the Regional Health and Safety Committee). The NEC also received reports on the Union’s expenditure in the first quarter of this year and from the auditors. If any branches are interested in the Union’s finances please get in touch for more information. The Chair of the Staffing Committee (Bob Oram – North West) reported that an agreement had nearly been reached with the staff trade unions on a pay and grading review linked to a three year pay deal. UNISON Insurance now has a website at which UNISON members can get quotes over the internet – http://www.uia.co.uk/. Various matters were raised arising from the minutes of various Committees. The most significant of these debates concerned discussion at the Policy Committee on the Public Services Not Private Profit campaign. John McDermott (Yorkshire and Humberside) queried the Committee’s decision, as reported in its minutes, not to support this campaign. I asked whether this meant that the Committee had also decided not to support the lobby of Parliament on 27 June. Moz Greenshields (East Midlands) also intervened to ask why UNISON would not support this joint union lobby. Glenn Kelly asked for a vote on supporting the lobby. At this point the General Secretary intervened to explain why he felt that, whilst we should “wish other unions well” with the lobby we should not ourselves support it. He felt that we should concentrate on working through the TUC, perhaps towards a lobby in the autumn. Glenn Kelly then asked that his proposal be put to a vote. The Chair of the Policy Committee (Jane Carolan) expressed the opinion that the decision not to support the lobby had already been taken. The President (Christine Wilde) stated that this was correct and refused to take a further vote, closing the meeting. From my notes of the meeting, it was incorrect to suggest that this decision had in fact been taken. I do not think that the NEC took any decision in relation to the lobby of Parliament on 27 June, called by the Public Services Not Private Profit campaign, and will raise this in connection with the minutes of this meeting at the next meeting of the NEC. Since first being elected in 2003 I have tried to send round regular Email reports to Greater London Region UNISON branches, as well as drafting the collective reports of London Region NEC members to the Regional Council and Regional Committee. I know that these reports have been welcomed by some colleagues, and not by others. I think that a blog such as this is a useful way to enable the members who elected me to hold me to account and to receive reports, upon the basis of which you can decide whether or not to re-elect me. It is unavoidable that a blog also has to be public, and other readers are welcome. But the purpose of this blog is to enable UNISON members in the Greater London Region to know what one of their NEC members is doing, because that is what I would want from anyone representing me. By their nature the official publications of the Union cannot carry detail about the work and opinions of individual members of the NEC – this blog is no substitute for UNISON’s official publications which you can access at http://www.unison.org.uk/. If you think this blog is a bad idea please let me know by posting a comment. If you think this is a good idea – well, you can find out who else is on our National Executive at http://www.unison.org.uk/about/national.asp. If you have any news about UNISON in Greater London which you would like me to put on this blog so that other readers see it, then please get in touch. This blog is under construction (I think that's what you should say, although "under construction" seems to me to suggest a building site rather than a website). I am considering using this blog to report - in a personal capacity - on my work as a member of the National Executive of UNISON.